I’ve wanted a headboard for a long time…like 5 years minimum. I longed after one I saw in the Spiegel website, but just couldn’t bring myself to fork over the cash for it (and now they don’t sell home furnishings, it’s been that long). I have expensive taste in home furnishing apparently. About 2 years ago, I realized I could make my own.. hypothetically. I mean…I guess it’s possible, but I was apprehensive about the skill level required. I told my boyfriend, Adam, about how I might like to make one. 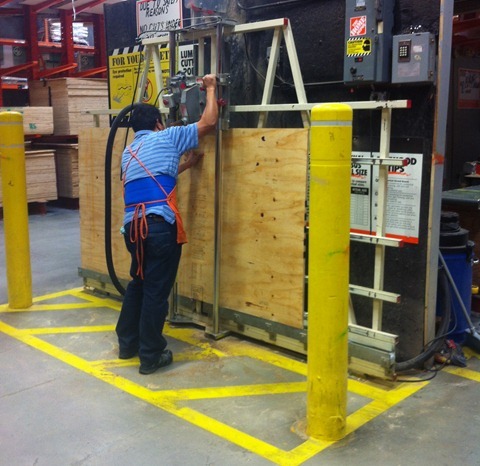 He said we definitely could handle the project…the 9 months slipped by. (How does that happen?) THEN I saw Karen’s post from Savin the Family Money. I’ve met Karen, and she’s a real person. I pinched her so I know this for a fact. So I also knew this project was realistically possible. We did things slightly different, but her post was a HUGE help. Here’s the before. Just to show you how pathetic our decorating skills were before the headboard explosion happened. Before we left for the store(s), we took a measuring tape and ran it from the floor up the wall behind the bed to determine what size headboard we wanted. 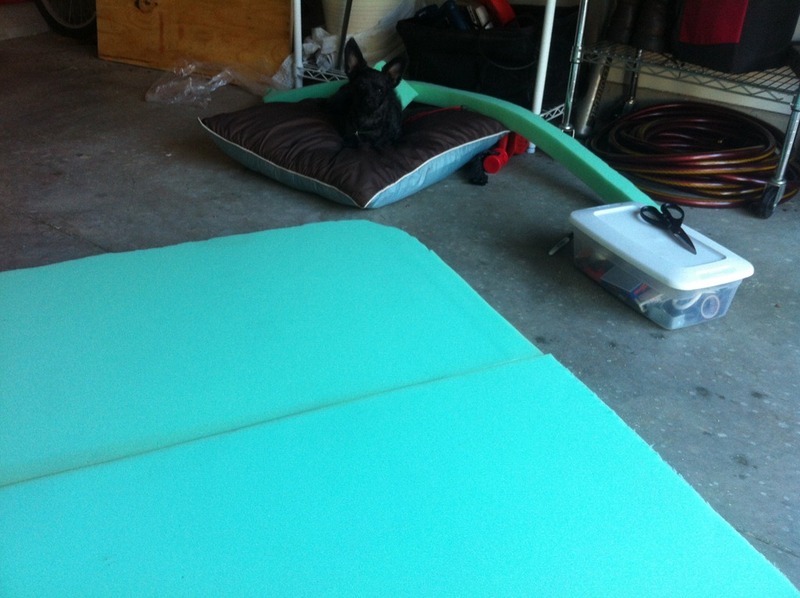 I’m lazy and wanted one we could just rest on the ground (no hanging or attaching). 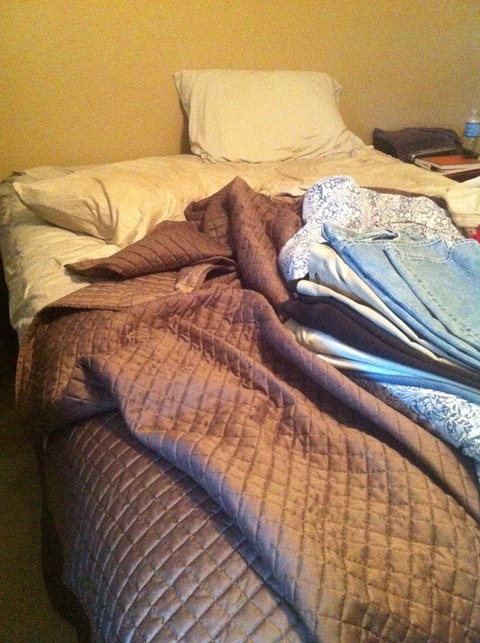 Our desired size ended up being 5 feet wide (queen size bed) x 4 feet tall. Another angle. 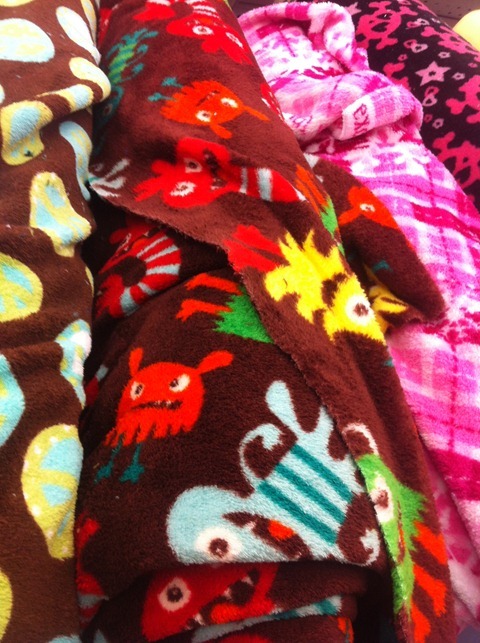 I took this photo so that I could remember what our comforter looked like when I went to go pick out fabric. DO THIS! It was a HUGE help because certain fabrics I might have selected based off the color I remembered did NOT match this same chocolate brown. Our first stop of the day was Jo-Ann Fabrics. We knew supplies we wanted (based off Karen’s post), so we went right to the most painful task first… the fabric selection. Oh boy, was there a line! We went on a Sunday (probably mistake #1) and there were about 40 people staring down the fabric counter waiting for their yards to be cut and measured. A woman saw my look of horror on my face and quickly reassured me that they were taking numbers and where the butcher-style number pull was. I walked up to it and saw a sign that said “select a number and continue shopping. we’ll call your number out when you’re turn is up” or something along those lines. With that done, we set off to find our fabric and gather our supplies. Hmmm. Which to choose… which to choose. Obliviously the one on the left is a fake-out. Sorry to disappoint, we did not go with that one. The one we chose was the one in the middle. I thought a nice light blue might compliment the chocolate brown. Or at least, I thought we were choosing the one in the middle. FYI, our store-bought room-darkening curtains are the same chocolate brown as the comforter. I bought them a few years ago way before Karen’s post on how to make your own. Fast forward through supply gathering. I realized after we were done getting our supplies, I hadn’t actually heard any numbers being called out over an intercom. I don’t really blame them because this would get quite annoying to hear if I was just shopping. When we returned to the fabric counter, we were happy to see we were up in 5 spots. 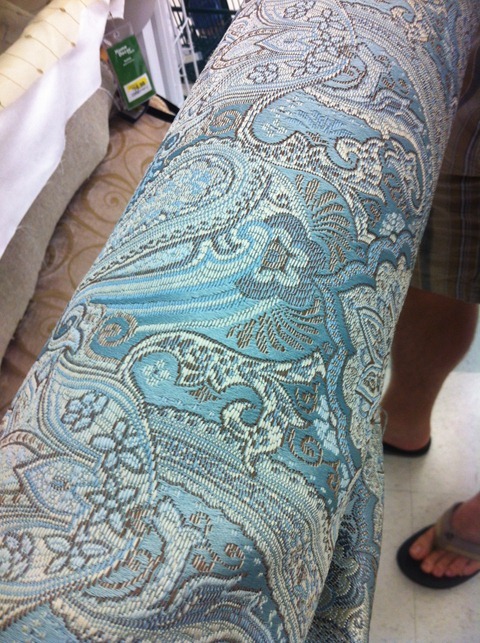 As we waited, I saw a lady’s cart in front of us that had the same fabric. Wait, no… it was the same pattern, but slightly greener than ours. 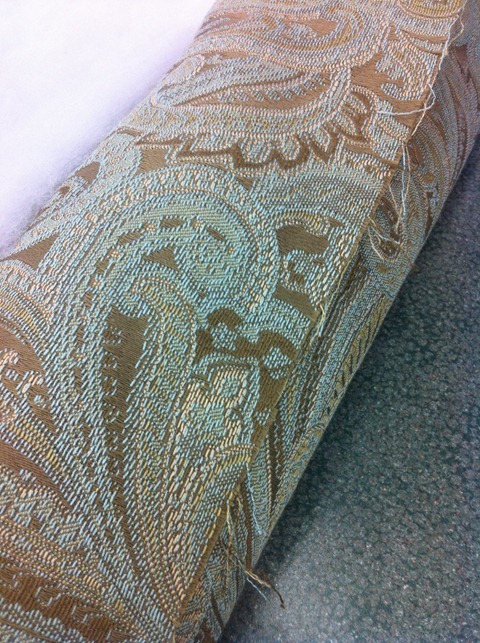 She walked up then, and noticed the fabric we had selected and said she liked our fabric better than hers. Hmm. I pulled up the photo on my iPhone and decided she was right. We should swap, so we did. 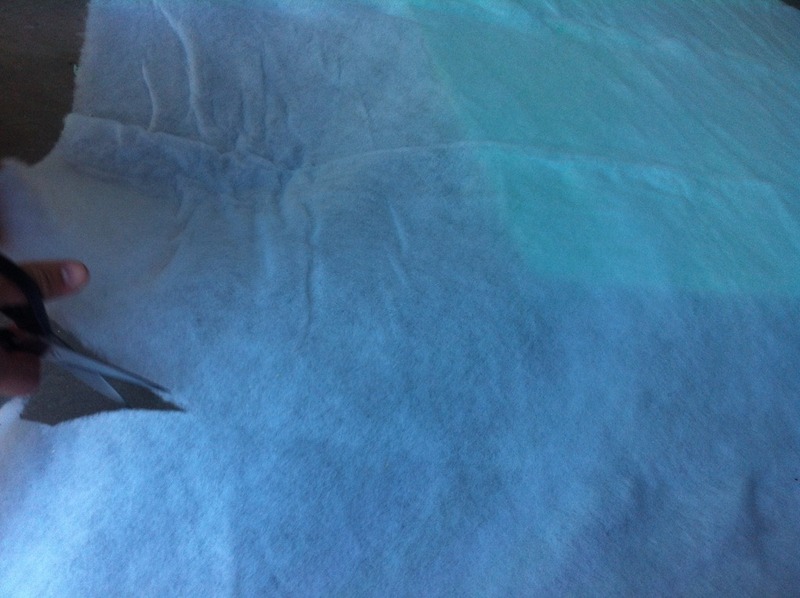 In the end, I ended up with the greener fabric. Right after that our number was called. The lady at Jo Ann (while extremely slow) was fairly helpful. We told her about our project, and she helped us determine what size we needed for everything. She also helped us find a cheaper batting than we had selected. Another tip I learned from Karen is to download the JoAnn app on your iPhone. You have access to the coupons all the time without fear of accidentally leaving it at home. When we went through check-out, our cashier was also really helpful at informing us as to which coupons would save us the most money. We ended up spending $123.63 at Jo-Ann (and saved $8.39). The coupons only worked on regular price items. Finally, we were done there and headed to Home Depot. We headed home. 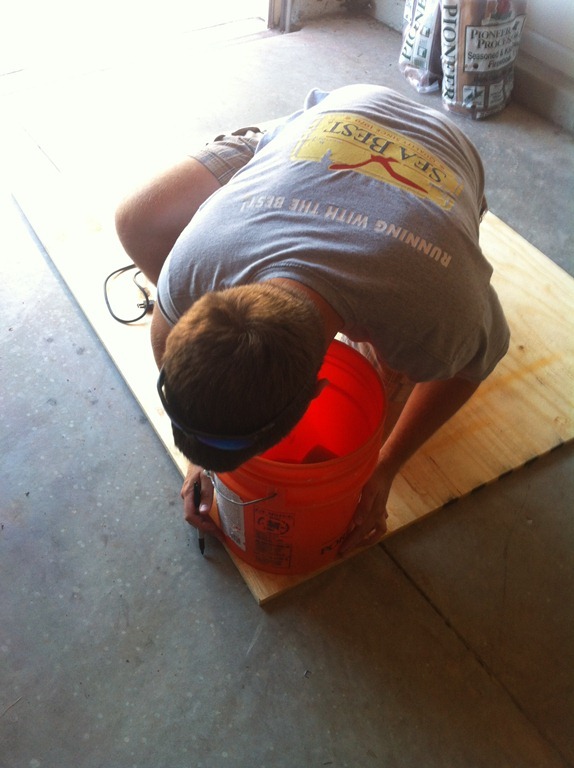 Adam used a 5 gallon bucket to mark the rounded corners. 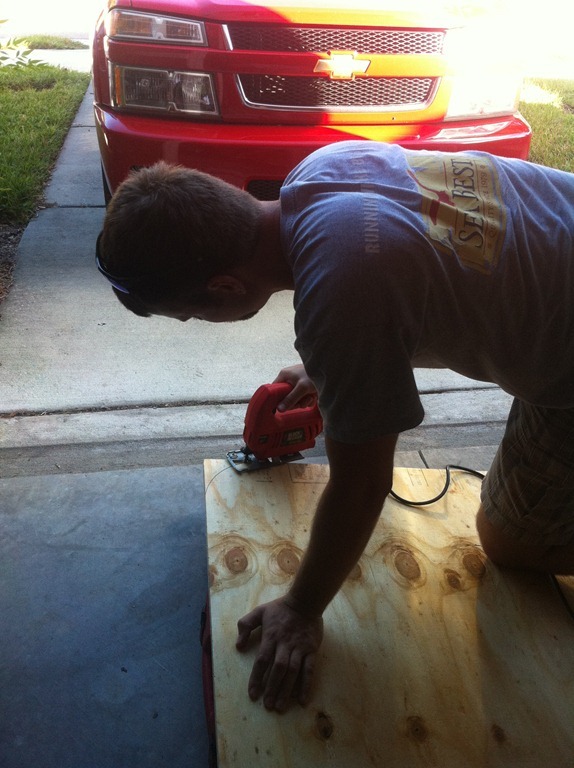 We don’t have any saw horses, so we just propped the board up on top of a plastic container. I think it was the box the jigsaw came in actually. You can see the red box peeking out in the picture above. Next we measured the holes for the buttons. 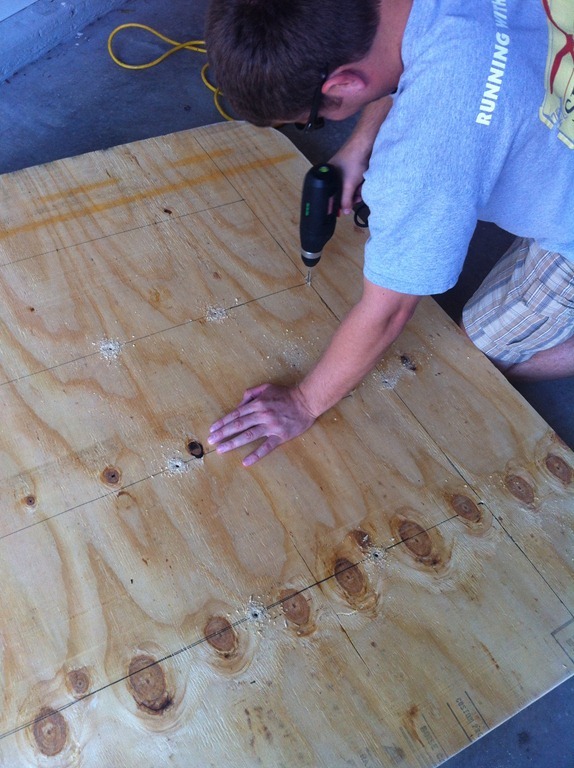 Putting the buttons in is actually the last step, but we knew we didn’t want to drill the holes later. We decided 9 inches apart would be our magical number and marked & drilled accordingly. Let’s hope so! 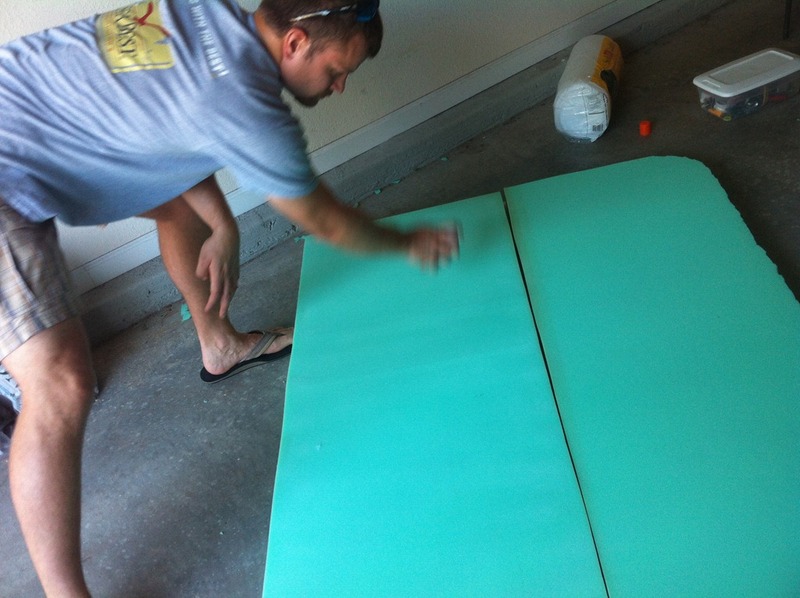 Then we laid the foam down. It was about 2 inches too long, like 4 feet 2 inches tall, so we realized we had to cut an end off. 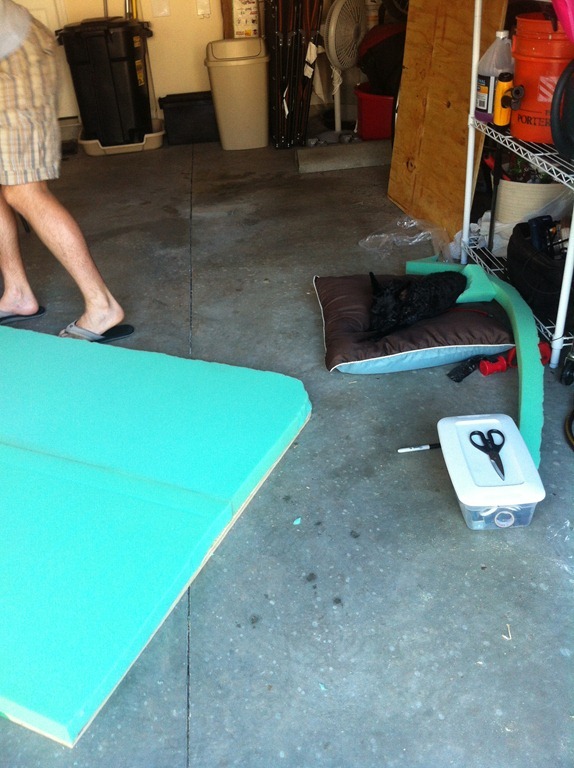 Since we already had to trim the rounded edges on the top we decided to just to trim one end instead of two. If I had to do this again, I would definitely lay everything so it lined up with the top, and hung over the bottom. This way, I would trim the bottom and just trim the rounded corners on the top. This would leave a smoother finish along the top. Also, I would trim the foam with an electric turkey carving knife instead of scissors. The scissors left uneven tread marks that were pretty impossible to avoid. 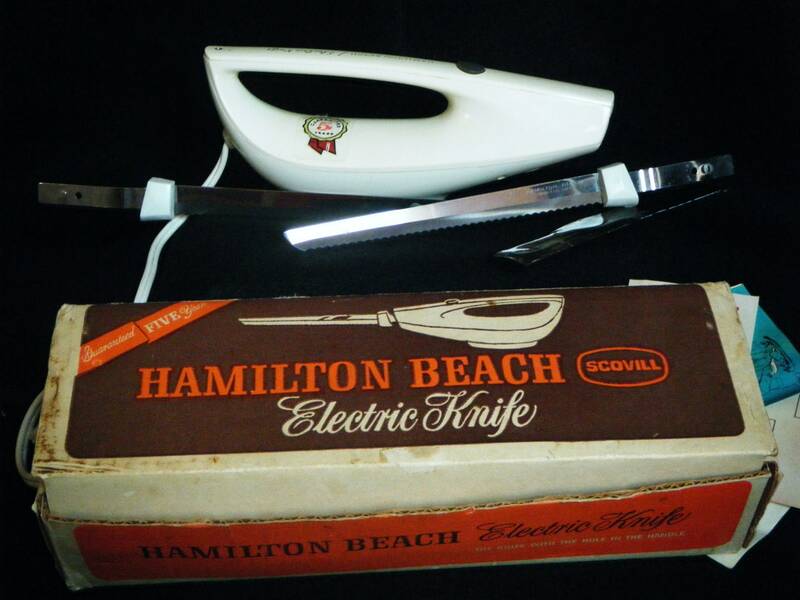 The electric turkey carving knife left a smooth cut (and was actually what the lady at the Jo-Ann fabric counter used too). No one can really see this other than Adam and I, so it’s fine. Well, you might be able to tell now that I let the cat out of the bag but let’s just not talk about it, ok? 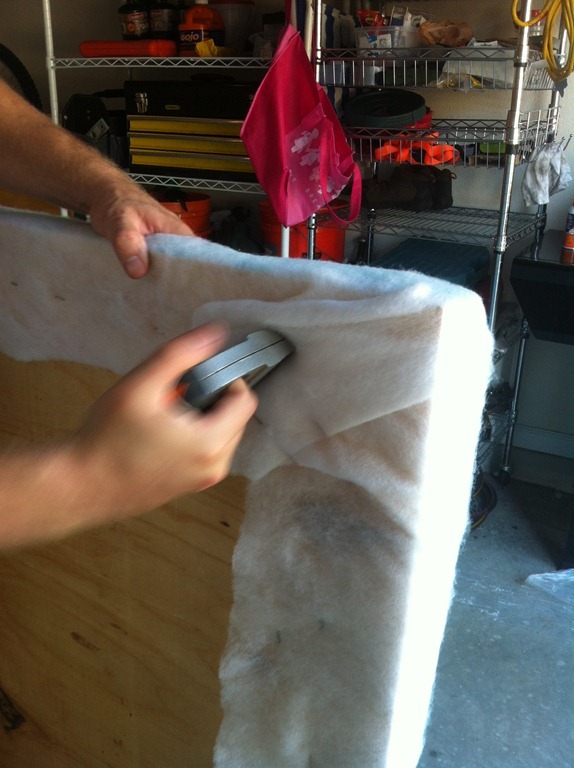 After the high-density foam was sized and trimmed, we laid it out on top of the plywood, sprayed it with the spray adhesive, and flipped it over sticky-side down onto the plywood. The spray adhesive keeps everything in place while you’re stapling, and probably keeps it from sagging later as it gets older. Next we spread out the batting entirely to make sure it was centered on the board. We needed to make sure there was about 6 inches overhang on either side. Then it was staple time! The batting wasn’t very strong, so we just folded it over and just stapled it town. We didn’t pull it very tight around the sides. After we finished with the batting, we did the same thing with the fabric. (I forgot to snag a picture of this) The fabric was slightly too short to fold several inches over the top and the bottom. (It folded, just not several inches) Knowing the top would be more visible, we made sure there was enough fabric to overlap there. The bottom ended up only having a few inches, but seems to work out fine regardless. Wahlah! The completed headboard (minus the buttons). Mistake #2? I forgot to buy extra fabric at Jo-Anns to make the buttons. Ooops. It wouldn’t take much, but we definitely did not have enough extra. I’ll just have to add those later. We could not be more thrilled with how it turned out! Next step? Find some sort of art to hang on the wall and maybe something on the nightstands. I’d say Vegas is a fan of the new headboard…or at least the extra pillows!! 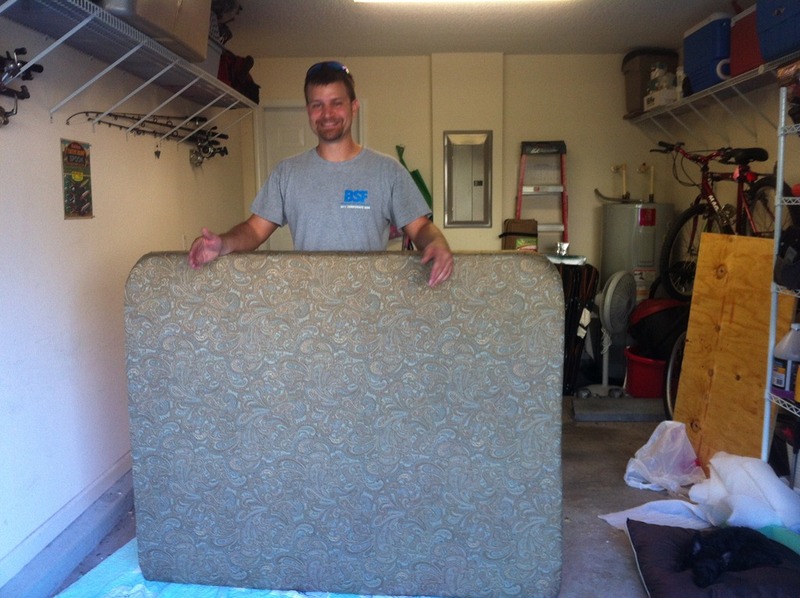 Have you made a headboard or something similar before? Posted in Craft Me CrazyBookmark the permalink.